In 2003, a funny thing happened: We were approached to be the faculty for the New Researchers Symposium (NRS). Our initial thought was, “Oh dear, how are we going to pull this off?” Our next thought was, “Of course we can!” Once that dust settled, we realized it is one thing to present a session or workshop, but two whole days is quite the commitment. The first step was to pause and breathe, and then trust in those who believed we could do this. The most important step, however, was to realize we could make a difference for those colleagues who were new to Apra — that was the best part. Once we were at that point, we were golden. Our run at NRS was 10 years. Michael and I would not trade the experience, memories and good times for anything. We learned a great deal over the years about speaking at conferences, Apra, ourselves and what giving back is all about. We are delighted to share some memories. When asked to speak, consider speaking with a best friend or colleague whom you respect. This takes the pressure off you doing a one-person show. What ultimately results is a built-in trust that your friend or highly regarded colleague will be by your side as you journey down the speaking path. But if you are speaking for the first time and speaking with a veteran of the speaking circuit, don’t place that individual on a pedestal. It places you as an assistant and not a co-presenter. Michael: For me, I knew that Liz was not going to let us fail. Before we started reviewing the material, we talked about our respective styles. How are they similar? How are they different? What are the strengths and weakness of both? All of this is important as you map out your planning. You do not have to be identical twins when it comes to style, and, in fact, different styles can complement your presentation if you identify and embrace them from the beginning. Don’t be afraid to express your weaknesses and use your partner’s strengths to build on areas you need to address. Liz: For me, I knew that Michael had an interest in private company data that came in part from coming from a family who owned private companies. Michael: I would not say I was an expert, but I had a passion for it and there were items I knew people should consider about looking at this asset. I think there is a misconception that private companies are only the “mom and pop” shops, when really the wealth in America is in private businesses. It also provided me a way of partnering with my gift officers in getting information we may not be able to find through research. I also knew that Liz loves the relationship management part. I saw Liz ― the “people person” ― work relationships with Apra colleagues, friends and co-workers. Liz: I always knew the value and importance of research and felt, “What better stage is there to show off what we do than bringing together researchers and fundraisers?” Watching all those collaborations and mutual respect moments is what made relationship management work for me. Challenging yourself as a speaker is a good thing, along with knowing your subject matter expertise and comfort level. You don’t have to be the number one expert to speak on a topic or subject. Simply ask yourself, “Do I have something valuable to share?” For us, we had so many subjects we were covering, we knew it was important to identify the places in which one of us was the primary presenter and the other was the secondary presenter. Presenting is challenging, to be sure. This opportunity keeps you on your toes — from speaking, to conveying the ideas, to offering solutions, to engaging in discussion and embracing different points of view. Dry runs are always a good thing. We identified a time prior to the conference to review all the material and our roles. We tried to predict if we could see any bumps in the road, knowing there would always be more. During your presentation, actively listen and watch the audience — identify those topics where engagement happens and those where the cell phones come out. You cannot please everyone all the time, but being aware is so important, especially in the beginning. This may sound funny, but listen with your ears and your eyes. Connecting with attendees through eye contact ensures you have embraced a question and that their opinion matters. Engage others in attendance, as well. Watching your audience and your partner helps identify any possible issues such as boredom. Another aspect of setting the stage is to check the room prior to presenting. You need to know your space and identify any pitfalls, such as pillars or an extremely wide room with no depth and a short platform stage on which to present. One of our NRS performances was at the Rivera in Las Vegas. “Wow, Las Vegas,” we thought. Little did we know this venue was at the end of the strip and looked like something out of Green Acres. We walked down the dark hallways through the sad casino with remnants of the night before into a dingy room with stains on the walls. We forged on anyway, always wondering what might happen next. We realized that the room in which we were speaking was as long as a football field and as deep as a table. Liz: I thought, “Oh, boy better get creative!” And we did. We decided to break the attendees into groups and use flip charts to capture the dialogue. And that was the symposium in which we projected our voices and got our steps in. One thing to remember is to be flexible regardless of the potential for a changing landscape. Michael: A memorable or terrifying moment for me was when the projector and laptop both kicked up their heels and died two minutes from the beginning of the session. I had two choices: Cancel the session, or embrace the moment. But honestly, the option to cancel was not in play. We have all been thrown a curveball, so I thought, “You better get creative fast.” I was so thankful I paid attention to all those improv classes I took in college. I changed the style and format, and engaged with the attendees. I ended up having a great session. It went so well, that after that session, I decided scripting myself is not the best thing to do. I think creating bullet points of topics you want to cover is better; you stand less chance of feeling lost or thrown off your game. Giving back is the most important point — it really does not matter how you choose to do this. Speaking, volunteering, reaching out to colleagues, joining a chapter or voicing a new idea are all important ways you can help to make Apra a better organization. Speaking at a conference or chapter meeting is great experience. Start small and see how it goes. Remember to always smile and have fun — this is the infectious part that spreads so easily. Elizabeth McHugh is a consultant specializing in research, relationship management and organizational assessment. Liz has been in the prospect development profession for over 30 years with experience in higher education at the ASU Foundation, in healthcare at Phoenix Children’s Hospital and Honor Health, as well as working for a variety of non-profits in the Phoenix area and beyond as a consultant. Liz is a longtime member of Apra and has been a frequent speaker on the topic of relationship management and research at Apra conferences, virtual seminars and chapter meetings, as well as local AFP meetings. She was a member of the Apra board of directors for six years, prior chair of the Apra Chapter Committee and a founding member of Apra-AZ. Liz was the recipient of the 2006 Apra Distinguished Service Award. In her spare time, Liz is the administrative director for Planetworks at Arizona State University. She is a native of Pittsburgh, an avid Steelers fan, and a bead and mosaic artist. Michael Quevli joined Blackbaud in 2008 after working for a number of years in nonprofit prospect development. Michael began his career in prospect research in 1996 at AIDS Project Los Angeles. He was also at the Keck School of Medicine for seven years prior to joining Kintera in 2005. He served on the board of directors for Apra for nine consecutive years and was president in 2012. Michael also served two consecutive terms for the California Advancement Researchers Association (CARA), where during his tenure membership grew from 165 to 300. He is currently serving on the board of trustees for Apra. Finally, Michael served for three consecutive terms on the Stephens College Alumnae Association Board. He is a frequent speaker for Apra and taught at the College of Extended Learning at Cal State Northridge in prospect research and prospect management. Michael is the recipient of the 2004 CARA Service Award and the first male to receive the Stephens College Alumnae Service Award (2007). 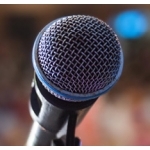 Looking for more great tips on being a speaker? Check out Apra’s speaker coaching page to help you stand up and stand out.